Taking the stage (or really, the alter), Band of Horses frontman Ben Bridwell said, “Feel free to yell stuff at us. Just don’t cuss.” This was, after all, a church, which is a pretty weird place for a Band of Horses show, even when the building in question has the rich SXSW history that this one does. Unlike, say, Grizzly Bear, who sounded gorgeous at the same venue last year, Band of Horses don’t make luminous music. It’s pretty, certainly, but also earthy and plainspoken and way more suited to gigantic muddy fields than houses of worship. An odd fit, then, but there’s no complaining about a great venue being matched up with a great band. 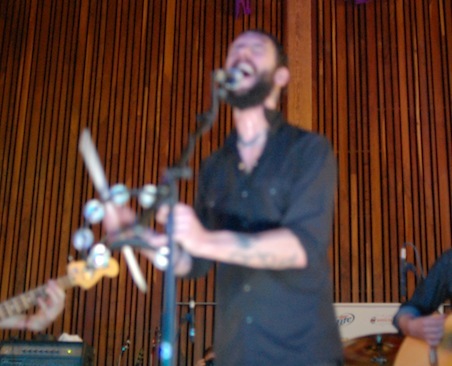 At this show, Band of Horses previewed songs from Infinite Arms, their forthcoming album. Based on those, we shouldn‘t expect any grand stylistic left-turns. A few tracks inch a little further toward old-school country and Southern rock without ever committing to either. On one, Ryan Monroe sings lead, which gives us a chance to hear Bridwell‘s voice singing backing harmonies, a nice little bonus. It’s hard to say on first listen, but few of the new songs seemed to carry the same grandeur as something like “The Funeral”, but then, this band always benefits from road-trip repeat listens, so immediate judgment is probably a bad idea. And they still played “The Funeral”, so everybody won. And it was just a treat to see a band this big, and this destined to get bigger, playing in a small room with an audience so rapturous that they applauded even when Bridwell thanked his management. People are on this band’s side, and with good reason. The No Age we’ve come to expect from countless DIY tours isn‘t the one who showed up to Red 7. For one thing, they’ve got a third guy onstage, twiddling knobs and tweaking samplers in ways that rarely had any identifiable effect on the band’s sound. For another, they seemed a lot less animated; guitarist Randy Randall, once a livewire, now rocks a beard and prowls a tiny sector of the stage. And the new songs we heard didn‘t carry much of the melodic sweetness that the band’s always been able to weave into its fuzzed-out firestorm. Instead, they’d build quickly from ambient hum to basement-show pummel, and the drama was all in the transitions. I had to leave their set early, but the new songs I heard all sounded pretty great. If they keep playing relatively low-key and simmering shows like that, though, some people will miss the old abandon. When I interviewed him last year, Washed Out mastermind Ernest Greene said he had no plans to turn his bedroom recording project into a live concern, but he looked pretty content onstage at the cavernous Klub Krucial. For one thing, he had a seriously crammed-in mass of crowd completely behind him. Down front, it was so hot and packed that I could barely move, but people were still dancing hard. (Somebody crowdsurfed. To chillwave.) For another, Greene didn‘t have any tape hiss or synth-smear obscuring his hooks or his beats, so the songs actually sounded like dance jams, and they worked just fine as such. Onstage, Greene doesn‘t do anything much performative beyond dancing around while he pushes sequencer buttons, but those tracks, and that crowd reaction, proved that he belonged up there. Greene started out the show himself, manning his electronics and sighing into his mic. Particularly on Klub Krucial‘s comically loud sound system, these tracks kicked pretty hard. Things changed a bit when tourmates Small Black joined Greene as his backing band halfway through. The band’s instrumentation fleshed out the songs in important ways. But members of Small Black also sang along with Greene and did it exceptionally badly, turning his wistful bedroom jams into off-key bro-down singalongs. Freddie Gibbs [Mohawk Patio; 10:50 p.m.
Not too many new rappers have the confidence to attack stages without hypemen, and even fewer do it with the force and panache of Gary, Ind., gangsta revivalist Freddie Gibbs. In every fundamental way, Gibbs is a hell of a rapper: lyrics, hooks, timing, delivery, enunciation, volume. He has no weaknesses. You can understand every word he says from across the room at an industry party where nobody will shut up and listen to the music. He never stands still onstage and punches every line hard. And a few songs, like “What It B Like” and “Cradle 2 the Grave”, sounded like huge bangers, though not necessarily actual hits. 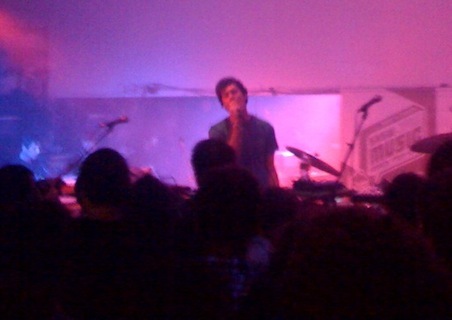 His beats carried a visceral punch, and he kept his brisk 20-minute set moving without lag time. Someone give him some more time next year. He’s earned it. 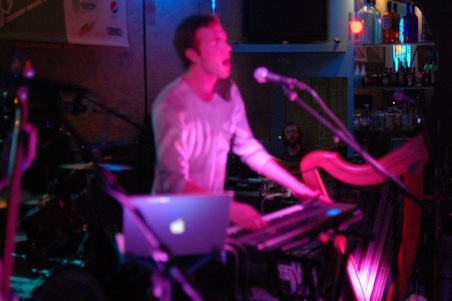 Active Child is Pat Grossi, a former choir singer who now makes hushed and otherworldly falsetto synthpop. His music and this venue were not, shall we say, an ideal match. It’s hard to emit ethereal wails when the crowd won’t stop talking. But Grossi, who looks a bit green onstage, makes it work anyway, just by playing music so overwhelmingly pretty that it absorbs whatever’s around it. Grossi switches among keyboard, harp, and guitar while a bassist plays spacey new wave bass riffs. Grossi is definitely a bedroom guy, but the basic elements of a possible greatness are all there. The Golden Filter frontwoman Penelope comes bearing at least a few pounds of ornamentation: bracelets, necklaces, scarves, kohl. But there’s nothing particularly gussied-up about the band’s glassy Italo-disco style. People have been pairing metronomic synth-burbles with breathy vocals for a long time. But the Golden Filter also have a live drummer and a keyboard player who bashes floor toms whenever he’s not playing keyboards, giving a little muscle to the band’s relatively bloodless arrangements. I’ll always carry at least a tiny soft spot for anyone working that genre confluence in this day and age, but the group’s hooks evaporate too quickly, and it’s not like they’re doing anything to dress that old Italo thump up in anything more memorable. I’d been hoping to catch guttural goth queen Zola Jesus, but it turned out Nika Danilova’s band was playing way the hell out by the airport. 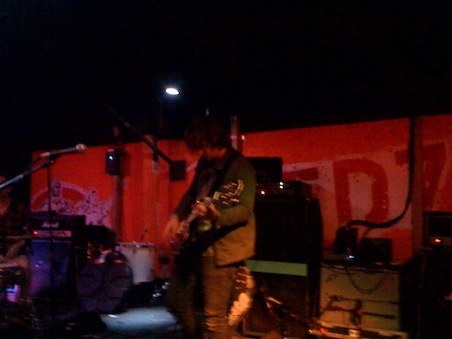 So instead I saw this Brooklyn duo, who played incredibly loudly in near-complete darkness at Red 7. Their combination of sculpted, bottom-heavy noise and tribal drumming sounded ritualistic, almost elemental. But where Zola Jesus or even their NY noise contemporaries Magik Markers let in some melodic throb and try a few theatrical flourishes, these two were nothing but creeping dread all the time. They did that dread awfully well, but it’s good that they only played for about a half-hour; I don’t know if I could’ve withstood much more.